White Paper Abstract: Health coaching is a critical tool in population health management, helping to boost self-management of disease and reduce risk and associated cost across the health continuum. In its fourth Health Coaching e-survey conducted in January 2013, the Healthcare Intelligence Network captured the ways in which healthcare organizations implement health coaching as well as the financial and clinical outcomes that result from this health improvement strategy. Through responses provided by 154 healthcare organizations, HIN found that 75 percent of respondents have a health coaching program in place, a slight increase of 5 percent over 2010, the last year the survey was conducted. 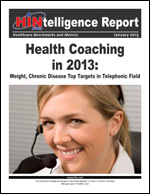 This HINtelligence Report provides data highlights on health coaching program components, the most successful tools and workflows in health coaching, results, reimbursement and ROI; and much more.